Christmas nail art pictures can provide a look at designs inspired by and appropriate for this festive holiday. You may need an elegant nail art design for a formal Christmas evening event, or you may want a fun or cute holiday-themed design to show off at a casual party. From simple looks to elaborate statement-making designs, Christmas is an excellent time to get creative with your nails. Take inspiration from one of the most popular Christmas symbols of all time and create a tree-inspired nail art design. For an elegant take on evergreen-inspired nails, use a rich green nail base and metallic and black nail art that gently curves or swirls, evoking tinsel around the Christmas tree. If you want to make a big impact with maximum sparkle, cover most of your nail with gold glitter nail polish. Add a rich red shade to the tips for a splash of seasonal color. This interesting twist on a French manicure makes for a festive and elegant Christmas nail design. If you love the look of gold glitter but don't want it on all of your nails, consider covering some of your nails with gold glitter and and others with a more subtle green. This is an elegant way to pair a traditional holiday shade with some seasonal shine. Glittery holiday nails don't have to be gold, nor do they have to be traditional shades of Christmas red or green. This blue glitter manicure with lighter blue tips featuring stars drawn on with a nail art pen is a wonderful holiday look. This style is both glamorous and retro, evoking memories of a blue flocked tree decorated with star ornaments. Glitter isn't the only option for adding sparkle to your nails for the holiday season. Simply covering your nails in a rich metallic color such as the lovely silver polish shown here is a great way to dress up your hands for the holidays without adding glitter, patterns or sparkle. This simple option is festive, yet is very simple to create and goes with any outfit. Obvious Christmas themes are a fun way to show off your holiday spirit, especially for a Christmas party or casual outing. Consider creating fun designs on long nails such as Christmas stockings, reindeer, snowmen or wrapped gifts. For a truly unique nail look, depict a different Christmas symbol on each nail. You don't have to go all-out with super-long nails and embellishments to adorn your nails with Christmas characters. Use nail art pens or small nail art brushes to create super-cute seasonal characters on your natural nails, even if they are short. Create a different character on each nail for maximum impact and to express your creativity. Delicate details can be appropriate for Christmas nails, too. A manicure can be dressed up in a pretty way that is both feminine and festive by applying touches of glittery polish and faux gems in seasonal colors. Add snowflakes using nail art decals or, if you have a steady hand, draw them on with a small nail art brush and white polish. You can get an equally festive look with less attention to detail when you start out with a French manicure with red tips. For this look, simply add splashes of glitter and nail decals shaped like stars or jewels. This is a simple but eye-catching idea for a Christmas party. 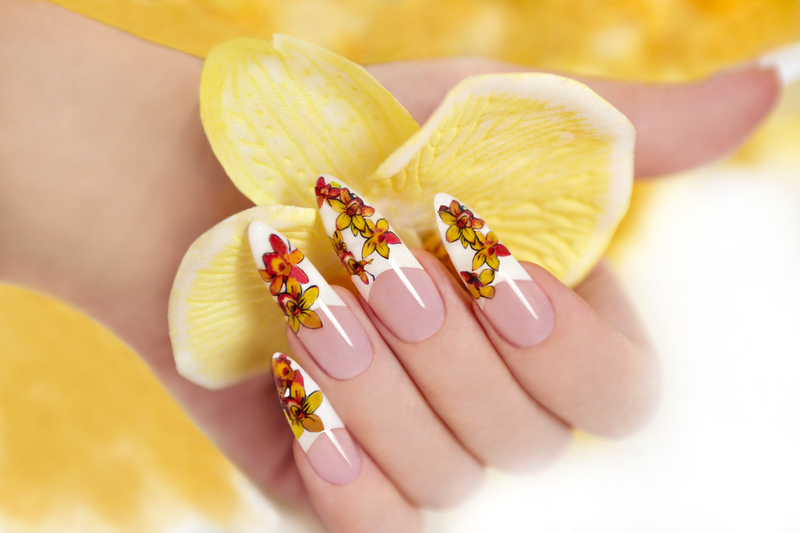 If you love the look of dressed up red-tipped nails but you don't have time to order decals or the patience to draw on delicate designs, this is a great option for you. Simply get a basic French manicure with red tips, then use a nail art pen or small nail art brush to add splashes of white below the tips in interesting patterns. For a more colorful look, add in splashes of green or alternate red and green tips. Although faux jewels or gems may feel too heavy for summer wear, the Christmas season is an excellent time to create more decadent jeweled nail designs. Use a traditional Christmas color, like red, along with other jewel tone shades to create a fresh and modern holiday look that will take you all the way through your New Year's Eve celebration. If you're a fan of long nails and maximum embellishment, go with a seasonal 3-D nail design like this arrangement of poinsettias and faux jewels. While this look might be a bit difficult to maintain for day-to-day wear, it is an incredibly festive option for holiday parties. Your nails are sure to attract attention when you go for an eye-catching design like this. Simple nails can be just as stunning during the holiday season. Alternating red, green and a glittery metallic nail color looks bright and cheerful. This option is an easy way to let everyone know that you are truly in the Christmas spirit! Whether simple or intricate, Christmas nail designs are festive and embrace the bright spirit of the season.